Whenever you visit Guatemala in Central America you have to go to Tikal. Tikal is one of the largest Maya cities in the jungles of Central America. We stayed in Flores, around 2,5 hour drive from the Tikal National Park. Fun fact; the old Maya empire called the city Yax Mutal. We wanted to see the sunrise from one of the large temples so we departed in the early morning around 03:30 a.m. arriving in Tikal around 05:30. From the gate of the park it was a short walk of around 30 minutes to one of the main temples that gave you a view over the temple area. Climbing the stairs was pretty hot work because of the high temperatures. Arriving on the main temple we where just in time for the sunrise. This was an amazing spectacle since the forest came to life with howler monkeys howling and bird sounds all around us. This temple is one of the only temples that can be climbed in the Tikal National Park. Our daytrip hiking had begun. 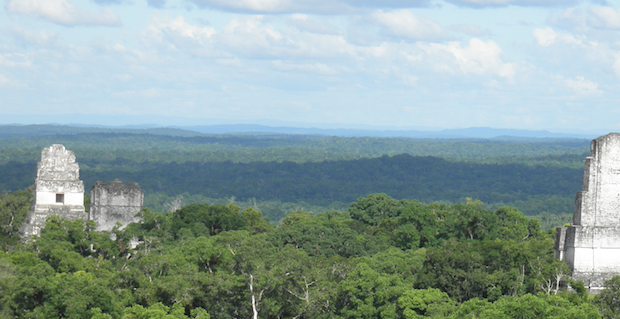 Since the Tikal area is 16 square kilometers you can’t hike all the way around in one day but crossing it is possible. We choose to visit the main temple sites and walk on some small shortcuts through the dense jungle. After one hour of walking from the biggest temple (the temples have names like temple 1, 2, 3 etc. so useless to call them by name and when you arrive in the Tikal Park the navigationboards will lead you) we arrived at the Great Plaza, this is the core site of the park. Two great temple pyramids and an acropolis flank this place. Temple II sometimes referred to as Temple of the Mask, on the main plaza is the biggest and best-preserved temple of the park it is beautiful. The enormous tree’s surrounding the temple site are just as amazing as the temples themselves. Walking on to the next temple complex takes around one hour; we reached Temple III known in Maya as the Temple of the Jaguar Priest. This was probably one of the largest man made buildings in Tikal but due to a damaged roof it partly collapsed and is slightly smaller then the others. We can see the biggest temple in the park nowadays from this place sticking out of the jungle canopy, Temple IV. Temple IV is over 70 meters (230 ft) tall and created during the Yik’in Chan Kawil dynasty. To bad you can’t climb the big temples it would be a hell of a view from up there! Walking around in the forest from acropolis to temple was a easy hike. You can visit the park with children, as no hard tracks have to be made sightseeing all the main temple sites. The must sees in the park are the Main Plaza, North Acropolis, Lost world Pyramid named Mundo Perdido near the Plaza of the Seven temples, Temple I, Temple II, Tikal Temple 33 and the view from Temple IV.